Stunning St. Nicholas Church (Kostel sv. Mikuláše) at the Old Town Square was completed in 1735. It replaced a parish church mentioned in records dating back to 1273. St. Nicholas is a Baroque church, the interior of which was inspired by the chapel of St. Louis-des-invalides in Paris. The delicate stucco decoration was executed by Bernardo Spinetti, and the frescos by Peter Adam the Elder. The sculptures are by Antonín Braun. In 1781 the decoration inside St. Nicholas was removed after emperor Josef II ordered the closure of all monasteries without a social function. In 1870, St. Nicholas then became Russian Orthodox. During the second World War Czech army units stationed at St. Nicholas were set to work restoring the church, working alongside professional artists. Much of what we see today is thanks to their meticulous efforts. After the war, St. Nicholas was handed over to the Czech Hussite movement, with whom it remains today. Interestingly, it wasn't until 1901, when the Krenn House in front of it was demolished, that St. Nicholas's stunning façade became visible to the rest of the Old Town Square. St. Nicholas serves both as church and as a magnificent venue for early evening classical music concerts. 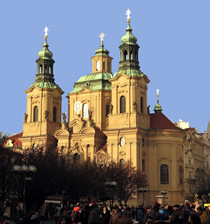 For listings and to book tickets for classical concerts at St. Nicholas Church: Prague concerts.